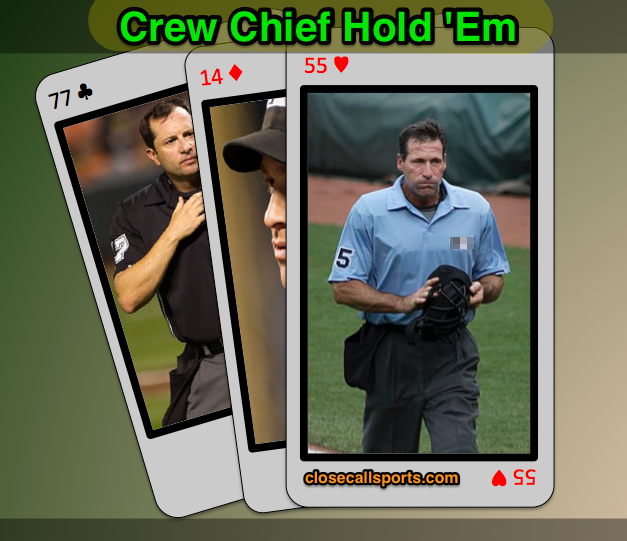 Let's play a little offseason ball and run the numbers for the most viable 'Umpire 2' candidates for promotion to crew chief, care of Dale Scott's retirement. For a little more spice, we'll consider Angel Hernandez's perspective, relative to his lawsuit against the MLB Commissioner's Office alleging an unjust denial of promotion to crew chief. Will 2018 prove, finally, to be his time? Which umpire's promotion is in the cards for 2018? Does plaintiff Angel Hernandez have a point—is he truly the most qualified candidate who continually is passed over? We'll also analyze some recent promotions to crew chief over the past few seasons to see if the numbers truly support Hernandez's case. We will conclude with a ranking of potential candidates for the crew chief vacancy based on the following analysis. The following sections contain conjecture based upon on-field and roster-based historical statistics. First, we define the terms and scope of this study. Eligibility: Generally speaking, an umpire is eligible for promotion to crew chief if: A) The umpire has served as a "Number 2" or backup crew chief on a Major League crew and/or has played the part of interim or acting crew chief; and B) the umpire actually wants, and presumably applies for, the crew chief role. Candidates: Although we are not privy to the details regarding which umpires fit criterion B) regarding interest in the position, we can narrow down the staff to those number twos who are most qualified. The following analysis will include only the top candidates who also fit criterion A). Generally speaking, there is great overlap between top candidates and those who are already number twos. Angel Hernandez has been #2 since 2002. Qualification Standards: There are a few ways to look at which candidates are most qualified to serve as a permanent crew chief. We will define three qualification standards for use in our analysis. 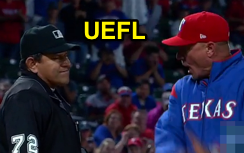 One metric is experience: How long has the umpire been a number two (var: Ump2), or what history does the umpire have serving as an acting crew chief during regular season play? The second is postseason work: What does the umpire's body of October assignments look like? Third, we consider performance: What are the umpire's RAPs, strike zone %, and observer feedback? Finally, intangibles takes into account extracurricular leadership qualities that generally can't be quantitatively measured. For instance, how, exactly, would one go about numerically factoring in achievements such as "Reverend Doctor" or serving on a Board of Directors (e.g., Calling for Christ or UmpsCare Charities)? Experience: The longest-tenured number two umpire on the staff is Angel Hernandez...by far. > Hernandez was promoted* to the number two/backup crew chief role prior to the 2002 season. > Notable relative to the suit: Alfonso Marquez became Ump2 in 2013, Laz Diaz in 2014 [U2 '12, U3 '13]. ^NOTE: Ron Kulpa was Ump2 in 2007, but was Ump3 from 2008-11. 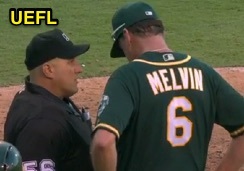 He regained Ump2 status in 2012. *For the purpose of this analysis, we use the term "promotion" to denote an umpire who has gone from a lower numbered role to a higher role (e.g., Ump3 to Ump2); this is shorthand for the statistical promotion that occurs when a lower-ranked number (e.g., 3) becomes a higher-ranked one (e.g., 2). 10 > Gary Cederstrom (Became Ump2 in 2004 [was also U2 in '02, but not '03], Crew Chief in 2008). >> At the time of Cederstrom's appointment, only Hernandez, Bob Davidson (retired), Jim Joyce (retired crew chief), Wally Bell (deceased), and Larry Vanover (crew chief) had more years of big league service. Hernandez is the only umpire from this list who is not a crew chief or out of baseball. 4 > Larry Vanover (2002, Ump3 --> Hernandez was an Ump2 on a Vanover cc'd crew in 2014). >> Accordingly, these four umpires on the leap frog list attained crew chief status prior to Hernandez. Jim Reynolds acted as a Crew Chief in 2017. 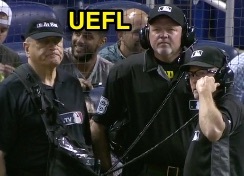 MLB recently has sought to promote some Ump2s who have served as Acting Crew Chief for a majority of the preceding season. For example, Mike Everitt served as such an Acting Crew Chief for a majority of the 2016 season in place of retiring CC Tim Welke, who spent the year on the Disabled List, while both Larry Vanover and Jerry Meals in 2014 acted in place of similarly DL-bound crew chiefs who subsequently retired (Tim McClelland and Gary Darling, respectively). 1 > Jim Reynolds has acted as a Crew Chief in place of Dale Scott from April - September 2017. 2 > Hunter Wendelstedt has acted as Crew Chief in place of Jerry Layne in recent years. 3 > Eric Cooper served as a Crew Chief during the World Baseball Classic Championship Round. 4 > Angel Hernandez notably served as a Crew Chief in 2013...in Cleveland...with this replay TV, which "isn't capable of full HD resolution." Said Hernandez after that game, "It was not evident on the TV we had that it was a home run." 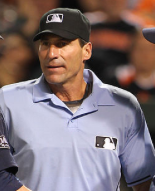 Postseason work: The current Ump2 with the most postseasons is Angel Hernandez (16 years). Angel wins the October metric. > The second-most is 13 years (Eric Cooper, Ron Kulpa, Greg Gibson). > The fifth-most is 12 years (Mark Wegner, Alfonso Marquez). The current Ump2 with the most postseasons since 2010 is Eric Cooper (7 years, most recent 2017). > The second-most is a tie between many umpires, including Hernandez (6 years, most recent 2017). Going into the 2013 season, the Ump2s (including crew chiefs mentioned in Experience promoted in 2013 or later) with the most postseason years of experience were Ted Barrett, Fieldin Culbreth, and Mike Everitt (11 years). > The third-most was Bill Miller (8 years). > The fourth-most were Paul Emmel, Angel Hernandez, Sam Holbrook and Jerry Meals (tied, 7 years). > Larry Vanover had 3 years. Performance: UmpTracker.com approximates percentage of missed calls and then ranks umpires. Its typical sample size per umpire is 15,000 callable pitches dating back to the 2014 season. Unlike many strike zone tools, UmpTracker allows for a certain "borderline range" where a marginal pitch may be deemed correct, but the fault in this strike zone tool, however, is that this range is small, relative to the UEFL "Kulpa" and "Miller" Rule standards. Eric Cooper wins the recent-K % metric. For example, Hernandez's lawsuit claims that in 2011, his ball/strike accuracy percentage was 96.21%, compared to a league average of 95.67%; barring a dramatic strike zone declination, UmpTracker appears to rank Hernandez too low relative to MLB/BOC's standard. Accordingly, the strike zone performance is presented as illustrative, and its weight in the analysis is fairly light. UmpTracker's data indicates Eric Cooper as the highest-ranked Ump2 (John Tumpane is #1 overall; Cooper is #2) since 2014 and Brian O'Nora as the lowest-ranked eligible umpire (86th). > Angel Hernandez's rank is 69, placing him ahead of Kerwin Danley (76th), Hunter Wendelstedt (77th), Dan Iassogna (82nd), Ron Kulpa (83rd), Paul Nauert (85th), and O'Nora (86th). > Of the crew chiefs mentioned in Experience, Hernandez's rank is better than: Bill Miller (72nd). > Of all active cc's, Hernandez's rank beats: Miller (72), Jerry Layne (80), Brian Gorman (87), Tom Hallion (92). Review Affirmation Percentage (RAP) is a metric of measuring Replay Review performance. Alfonso Marquez wins the RAP metric. > The Ump2 with the highest RAP since replay began in 2014 is Alfonso Marquez, whose .673 RAP is 3rd amongst all umpires (Livensparger .700, Carapazza .682). 35 of Marquez's 52 challenged calls have been upheld. Throwing out Livensparger (sample size is only 10), that leaves Carapazza as the best in baseball over that span (Carapazza: 45-of-66). > Other notable Ump2s with above average RAPs since 2014 are Wegner (.618, 12th overall), Gibson (.590, 14th overall), Reynolds (.541, 27th overall), Carlson (.532, 30th overall), Timmons (.530, 32nd). > Hernandez has experienced 76 total Replay Reviews since 2014, with 36 affirmed and 40 overturned calls for a RAP of .474, or 66 out of 102 tracked umpires. > Hernandez's RAP is better than Ump2s: Danley (.473), O'Nora (.460), Kulpa (.443), Randazzo (.406), Cuzzi (.375), and Iassogna (.370). > Hernandez's RAP is better than Experience CCs: Emmel (.469), Cederstrom (.449), and Meals (.425). Wendelstedt wins the raw overturn metric. Another way to consider Review performance is raw number of calls overturned on the premise that managers will not challenge a correct call, which means an accurate umpire may have a low sample size RAP simply because of calls not being challenged. > The Ump2 with the fewest overturns since 2014 is Hunter Wendelstedt (16), followed by Marquez (17). > Hernandez has 40 overturns since 2014. This is less than Ump2s: Randazzo (41) and Iassogna (46). > Hernandez's 40 overturned calls are fewer than Experience CC Meals (42). Obviously, observer and supervisor reports play a large role here as well, but these are the unknown variables to which the public is not made aware. Intangibles: By intangibles, we refer to leadership qualities not represented by on-field statistics. For instance, current crew chief Ted Barrett is a leader in the Calling for Christ ministry and has the theology PhD to prove it. Let's discuss our 2018 crew chief candidates. Alfonso Marquez serves on the CFC Board of Directors (and helped found the ministry) and founded a non-profit called Fonzie's Kids, benefiting poor children in Mexico. Here's his story. Jim Reynolds is Secretary on the Board of Directors for UmpsCare Charities, Secretary-Treasurer for the World Umpires Association, and, with his degree in Communications, is possibly the only umpire to update his personal biography in the Umpire Media Guide every year. Hunter Wendelstedt runs one of only two professional baseball-approved umpire schools and has represented the school at meetings with the city of Ormond Beach, Florida, and beyond. He too serves on the WUA Governing Board. Finally, Angel Hernandez served as chairman of the board for The Miracle League, hosting multiple Miracle League Golf Tournaments to benefit young people with physical and mental disabilities. Conclusion: Hernandez's best argument for crew chief promotion was MLB's failure to promote him between 2013 and 2017, opting instead to promote eight other candidates, at least three of whom statistically lagged behind Hernandez, and all of whom were less experienced. This is quite consistent with Hernandez's lawsuit, in which he states, "Hernandez's excellent work was recognized by Major League Baseball...from 2002-2010...However, Major League Baseball's attitude towards Hernandez changed in 2011 when Joe Torre arrived in the Office of the Commissioner." Former MLB VP Bob Watson. Succinctly, it would appear Hernandez was on track for promotion under former VP of Rules and On-Field Operations Bob Watson, who retired in 2010, but fell out of favor at some point over the next few seasons. 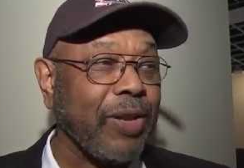 For the record, and although he did not publicly sue baseball, Watson previously lodged a complaint similar to Hernandez's regarding the sport's lack of diversity in leadership roles. Hernandez had more experience as a backup crew chief or "Number Two" than the eight umpires promoted since 2013. Specifically, Hernandez's overall rank in promotion potential during that time (which, essentially, throws out the performance metric related to Replay Review, since it did not exist in expanded form during that period) would have ordinarily placed him notably ahead of Emmel, Miller and Meals, and marginally higher than Barrett, Culbreth, Everitt, and Vanover. Due to his absence in 2014, Holbrook is a bit trickier to compare (due to an entire season's worth of sample size missing). With RAP thrown into the mix, it would behoove us to look at other MLB crew chiefs: what's the average crew chief all-time RAP? Turns out, it's not all that high. 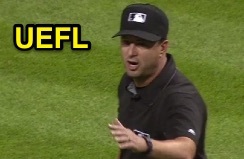 From a low of .378 (Tim Welke) to a high of .577 (Fieldin Culbreth), the average all-time crew chief RAP of .496 is actually lower than the league average for all umpires (.506). Of the five crew chief promotions since 2015, only Sam Holbrook's RAP of .547 exceeded the .500-mark. Hernandez's .474 RAP, for example, beats 2017 hire Emmel's .469 and 2015 hire Meals' .425 clips. Replay appears low on the -cc checklist. Thus, we can surmise that RAP-related accuracy—and thus, calls on the bases in general—don't heavily factor into MLB's promotion decision-making process. The fact that Hernandez ranks 66th in RAP means very little, given Emmel (70th) and Meals (84th)'s promotions; Vanover's .476 RAP (ranked 65th) barely edges out Hernandez, as well. To be thorough, Hernandez also ranked higher than crew chiefs Jim Joyce (.457, 72nd), Gary Cederstrom (.449, 75th), John Hirschbeck (.447, 77th), Gerry Davis (.411, 86th), and Tim Welke (.378, 89th). The confounding variable of internal statistics, figures, observer/supervisor reports, and findings to which we are not privy to serve to complicate matters in such a great fashion that it would be unreasonable to conclude with a significant degree of certainty whether or not Hernandez was unfairly passed over in favor of less qualified or experienced candidates; we know he hustles, but we don't know how that manifests in league reports. Hernandez's path appears to have changed course in the early 2010s, but the files are beyond our reach...until and unless the lawsuit brings them out into the open. All we can go by, for now, is publicly available statistical data. Taking the numbers into account, and baseball's disinclination to award call accuracy with promotion, the following list ranks candidates based heavily on the following variables: Ump2 date (year promoted to #2), years of postseason experience, RAP (to break any ties), and a simple answer to the question of whether the candidate has ever served as an acting crew chief: Answers are either YES (has served as Acting Crew Chief for many games), Not Extended (has served as Acting Crew Chief, but only sparingly), or NO. 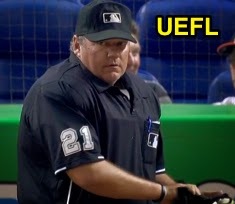 6 > Brian O'Nora (Ump2 date: 2009, postseasons: 7 [5+], RAP: 71st, Acting CC? YES). Marquez is Crew Chief with Joe West as #2. 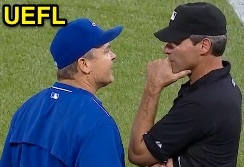 Gil's Call: Based on statistics alone, Angel Hernandez should be the next MLB crew chief: he is statistically leaps and bounds ahead of the rest of the field. However, based on the previous season's circumstances, it would appear the powers that be auditioned Jim Reynolds for Dale Scott's crew chief vacancy. If he passed the test, Reynolds will likely be the next Major League crew chief. It would surprise me if Hernandez is promoted instead, as the biggest predictor of who will be hired as a crew chief is whether the candidate served as an Acting Crew Chief for an extended period of time during the previous season. Reynolds, thus, fits that bill.